Have hugs and happiness led to a better, more enlightened world or to increasing levels of self-absorption? The ubiquity of the Hug, as Adam Curtis has recently highlighted, on TV and across media has promoted certain standards about how we should display our feelings and what our ability to show our emotions says about us as human beings. I want to suggest that the Hug has become a part of the modern problem of not being able to imagine any alternative to the world of today. The Hug is no longer liberating, it is restraining. For Curtis the hug, contary to its promise, is not liberating nor is it an opportunity to connect with a deeper sense of authenticity but rather has led to the creation of a population of inward-orientated, self-absorbed people. An article by Slavoj Zizek recently featured in The Guardian, discussed the Wall Street protests and the (lack of) demands of the movement. In this article Zizek remarked: “One of the great dangers the protesters face is that they will fall in love with themselves.” It could be seen that both Curtis and Zizek are grasping at a similar theme. The protesters of Wall Street, St Pauls and elsewhere may find they share a common goal of a desire for an alternative. In these moments of marginalisation a sense of solidarity is fostered amongst the protesters. But the danger Zizek speaks of is the danger of failing to counteract the desire to belong, to be part of something special, to feel exclusive. If they fail in this the protesters will subsume into a clique, too busy facilitating their own egos, admiring their own feats of courage. For the protesters should realize they are merely an instrument in the process; they are not an end in themselves. 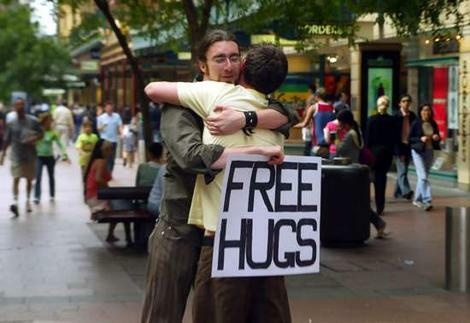 The hug is presented here as the ultimate way to connect with others. It is utilized as a way to counteract the isolation and alienation of modern life. Similarly happiness rhetoric re-emerges at moments of crisis as a means to overcome the discontentment we feel. While there is nothing inherently wrong or problematic about wanting to feel good; problems do occur when the desire to feel good is at the cost of dealing effectively with the inequalities in society. Feeling happy becomes a way to avoid and turn a blind-eye to world outside. The hug is thus used actively or passively as a quick-fix solution to both internal (problems of the self) and external (social, political and economic issues) dilemmas. This display of emotion via the hug is deemed as a truer more authentic action in contrast to the cold, mechanical world around us. And yet the hug in its ubiquity has become a shallow and meaningless instrument used to provide the idea of intimacy. A hug becomes an obligation that shows what a caring, kind-hearted person you are. If you do not engage in this required etiquette you are somehow deficient, your personality is flawed. The obligatory hug can serve to smother the potential to explore our nature rather than stimulate it, as it limits the possible ways for self-expression. The protesters too will find their potential smothered if they continue to limit their gaze with short-sighted vision. The lack of tangible demands of the protesters is a real and pressing one. And while it is fair to say that creating a space for questions and ambiguity is important, the struggle to provide an alternative message speaks to the consciousness of the protesting generation. This could be witnessed in full effect in the London riots in August. What began with a purpose swiftly descended into incoherence and apathy. It would seem young people (and indeed old) don’t know what they want, so they latch on to ideas easily and easily fall back on to old ideas when the new ones fail. The rioters in London lost their intentions and returned to the wants they had been indoctrinated with, i.e. consumption and materialism. The question of what do we want – as Zizek details – is an significant one and not only in regards to the current protests against capitalism. The ability to decipher what we want has been destroyed by growing up in a generation in which each individual has had to endure the bombardment of fantastical images that tell us what we want. Silence is no weapon despite what Zizek may claim but a poor offering that exposes the confusion at the heart of the protesters and the fear of radical visions. A gap in the political consciousness has opened, a space that has been steadily worked and fought for, so why are we not asking the right questions? Why are banners such as this one being held at the St Paul’s protest? Happiness does not have to be synonymous with wealth, yes, but why are we asking to be measured in any form? Happiness can be – and is already – easily exchanged with wealth as a measurable factor, through a process that will go the same way as the hug: bound up in obligation, destroying contingency, spontaneity, the haphazard nature of emotion; a mere token in the capitalist game. The desire to protest and the desire for hugs and happiness all come from the same place. They are all caused by a dissatisfaction and discontent with the state of things and a need to make it all better. Yet in the flurry of protests and hugs it is easy to look inward rather than out and get absorbed in fostering each other’s egos. This is perhaps a tactic to avoid what is happening in the wider world, but it is also a tactic to avoid looking truly deeper into ourselves. When we take a look deeper we see we don’t really know what we want. There is fear and confusion and ambivalence. A hug provides a comfortable space of introspection without the danger of entering territory that will question your sense of self. The protesters too will remain in this non-space of no alternative if they refuse to step out of their comfort zone. It is not possible to conjure radical visions from a subjectivity that is so entwined with the form of individualisation – the identity – tied to the state, for each time they provide an alternative it will only be a demand for an adjustment of the system – e.g. 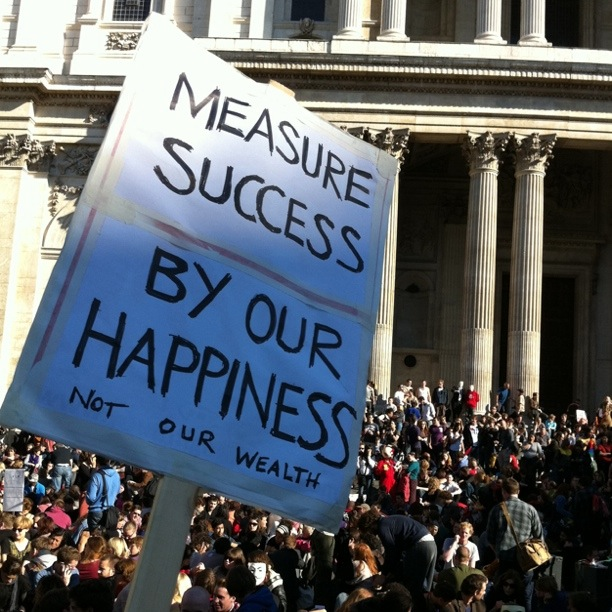 measuring happiness instead of wealth. So how to voice this alternative? Lets start with less hugging and more awareness; let’s finally open our eyes and (to paraphrase Luce Irigary) lets not congeal our dreams and desires in unique and definite representations any longer.